If anyone had told Marisol Moreno Ortiz just a year ago that she would be presenting at an international conference in the UK, she would not have believed them. 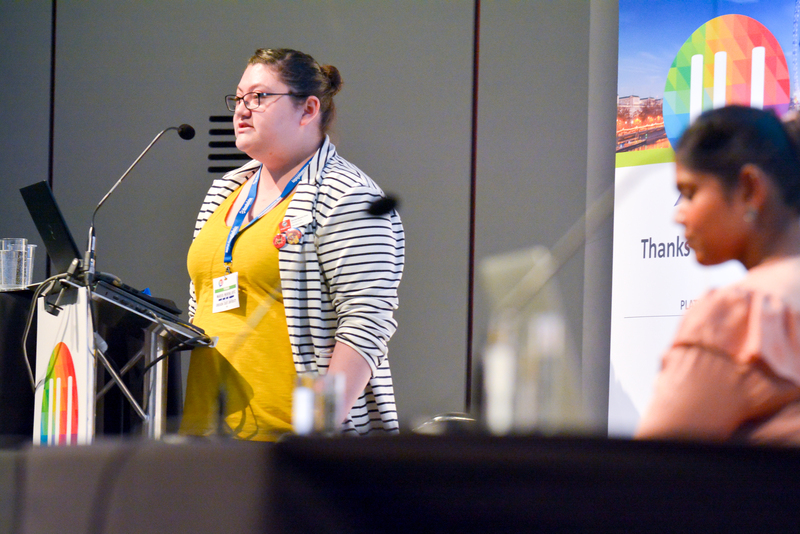 In October 2018, after successfully applying through a Call for Speakers process, I spoke at the Internet Librarian International Conference (ILI) in London. I was invited to join a panel called The diverse workforce. I presented my experience in the Oregon State University Libraries and Press Diversity Scholars Program (DSP). I talked about how this program came to be and the many things I found invaluable that allowed me to communicate how important it is for libraries to make an effort to create diverse initiatives to diversify the profession. I shared information on how the DSP provided me with experiential learning opportunities that helped me overcome my imposter syndrome and begin to develop my identity as a librarian. As a person of colour, being welcomed at this conference was something that was joyous to me because I was not only representing the DSP and myself, but also giving people of color a presence in the conference. It was a wonderful opportunity for me to provide information to the audience that would encourage them to work harder in increasing diversity in the library profession and at conferences like in ILI. ILI was my first professional library conference where I presented on the DSP. It was also my first time crossing the ocean and traveling abroad by myself. All these new experiences brought anxieties of course, along with my concern of not doing a good job on my presentation. However, my panel moderator and the other two panelists were very supportive. I was miles away from home and yet I felt like I had three cheerleaders rooting me on. I also learned that I can handle different kinds of anxieties at once, which is very helpful when multitasking. Something that was surprising to me, but very helpful, was that a couple of days before the conference, my panel’s moderator warned me and the rest of the panel that the audience would be primarily white and she was right. Out of the fifty-seven people that attended my session, I can only remember two attendees that were people of color. This was something that I didn’t expect. I expected the conference to have more representation, but I was wrong. I was under the belief that the UK was much more diverse in the profession, but it seems that from the 20 countries represented in the conference, few were librarians of color, which means that the profession still has a long way to go. As a person of colour graduating in Spring 2019 with my Masters in Library and Information Science, I have enthusiasm that diverse initiatives will continue to grow. I am glad to have shared my experience to get librarians to think about the many different ways they can help welcome diverse populations to librarianship. With ILI continuing to welcome professionals from diverse backgrounds to present about their work and experiences, this will give more agency to the importance of welcoming change with the richness of their presentations and insights. The library profession is one of community and helping each other. Librarians ask each other for help finding a book for a patron that they cannot find. Why not do the same within conferences? Why not ask librarians help in welcoming our diverse colleagues to the conference? Why not ask each other, will you help me reach out to our diverse colleagues? This would help our diverse colleagues to feel supported in submitting a proposal to be part of ILI. Moving forward as a profession that provides information and knowledge to a wide diversity of individuals, it’s important to have librarians and other library staff that represent that. ILI is in the position to provide the avenue for ideas in order to accomplish this and with welcoming me, the organisers of the conference have shown that they are invested in the profession becoming more diverse. And for that I thank them and hope that next year the conference has more people of colour presenting on their work. Marisol Moreno Ortiz is an MLIS Student and Diversity Scholar of OSU Libraries and Press Diversity Scholars Program. Her MLIS institution is Louisiana State University but she is located in Oregon. Marisol will receive her MLIS degree in May 2019 and hopes to find a librarian position at an academic library working with first-year and first-generation students. Does speaking at Internet Librarian International sound interesting? Follow the conference on Twitter to keep an eye on the call for 2019 speakers alert.